One of my favorite reviews to write are those that feature products that I have a long personal history with but are not products everyone has heard of. I have been noted as an edged weapon and knife expert by more than a few folks over the years and volumetric-ly have several bushels of knives to prove it, but the one knife has seemed to end up in hand for all manner of task quite often is my Executive model Christy Knife. After inventing and patenting a nickel-plated, serrated-edged bread knife, machinist Russ J. Christy formed the Christy Knife Company in 1889 in Fremont OH. Since then, it remains one of Fremont’s oldest businesses and one the community has stood behind. Five years after opening the business, the company needed extensive building improvements to remain in Freemont and a community committee raised $5,000 in local pledges to ensure that the business remained in the city. The building improvements were complete and Christy Knife grew to employ sixty workers in its new factory, and by 1897 distributed cutlery products nationally, and worldwide through its London office. Even through factory fires in both 1902 and 1910, the company still grew to over one hundred workers by 1917 manufacturing a full line of cutlery. The 1906 invention of a single-edge safety razor saw the company through the material shortages of World War I. 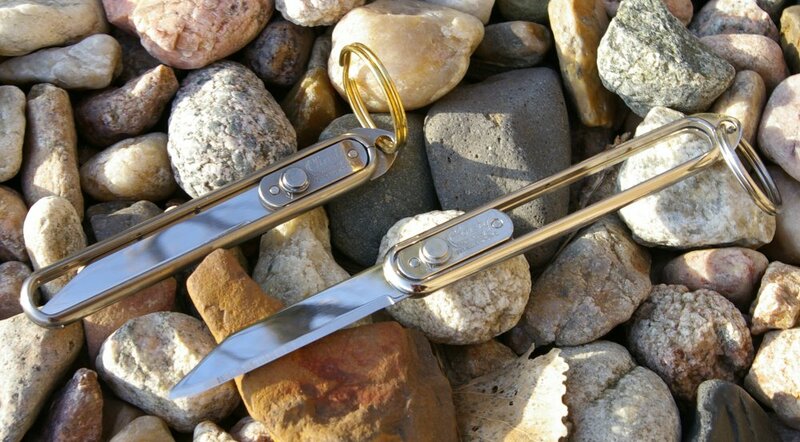 Following the war, Christy developed and patented a unique pocket knife with a retractable blade and it was this single product’s sales which spared the business from collapse during the Great Depression. Even more impressive in this age of acquisitions and a business crushing economy is that the company is still owned by the Christy family. Russ Christy started the company and then D. Lamar Christy managed the company from 1920 until 1955 when Earl Christy took over. During this period, surgical blade production for a Cincinnati surgical instrument company represented eighty percent of the company's revenue. With such a dependence on the one contract, many feared that when the loss of the contract occurred in 1961 that Christy would surely close. The drastically reduced work force continued production of only a single item, its world-famous "Christy Sliding Blade Pocket Knife." 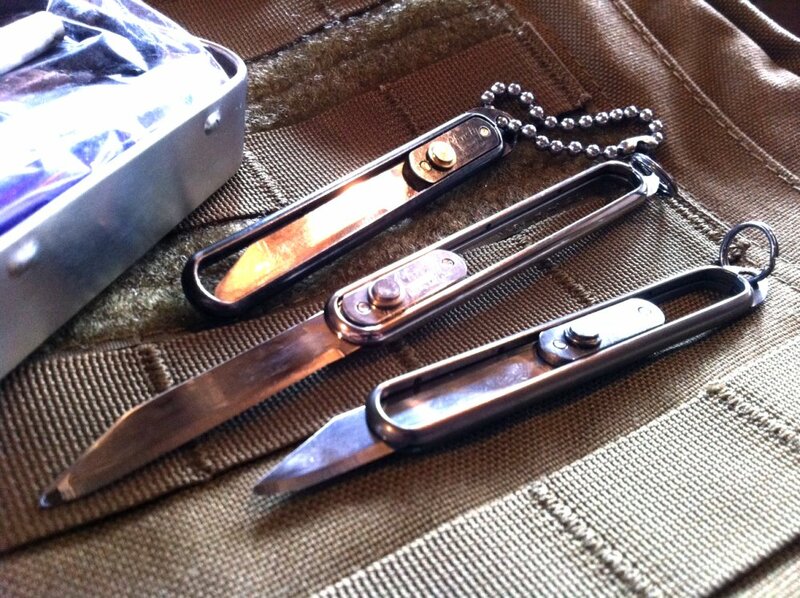 The pocket knife was carried by men and woman and during WWII, military post exchanges around the world sold the Christy knives to our men in service. The Navy issued the Christy knife to pilots as a mini-survival knife and for a time the US Customs schools issued the knives to graduates. Today the company still lives on even stronger than it was five or ten years ago in the same town it was founded with a new location and excellent updated website. The Christy Sliding Blade Pocket Knives are still made on the original 53-operation production line and equipment, but now operated and produced by machinist Hal R. Christy, son of Earl Christy. There are very few 4th generation family owned companies in the world and this one continues to provide “the handiest pocket knife ever designed” available in the Companion (nickel plated), Executive (polished black nickel plated), and the Traveler (matte finish Teflon nickel plated). I picked up a Companion and Traveler to use to build a couple little mini-survival and fire kits. The idea of the Christy knife is elegantly simple and ships with a key ring in a nice plastic re-usable case. 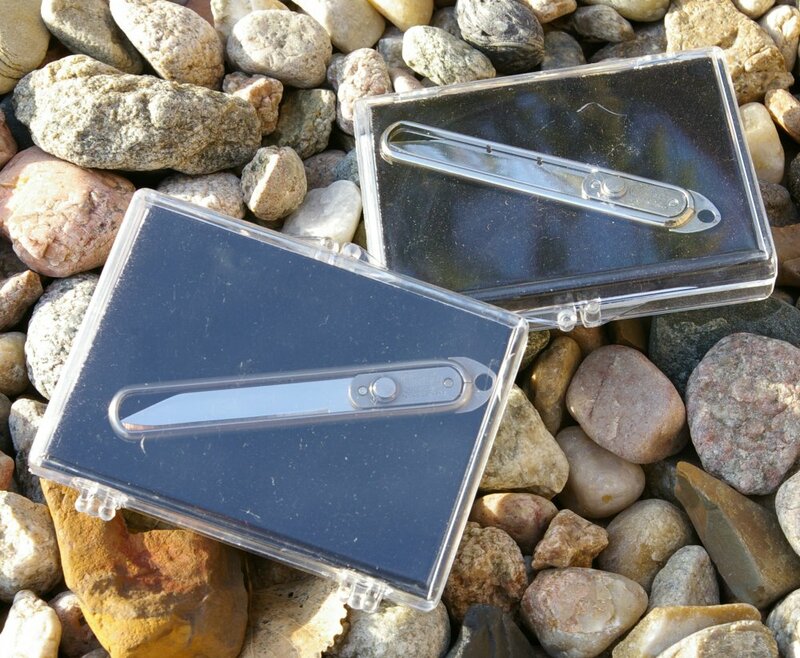 The blade slides in a channel inside the handle and locks in one of four positions including closed. In a time before Spyderco had the idea to put a hole in a blade for thumb opening, this ground breaking single handed operating knife was simple to use by sliding the round spring loaded button down and forward or back to open or close the knife. 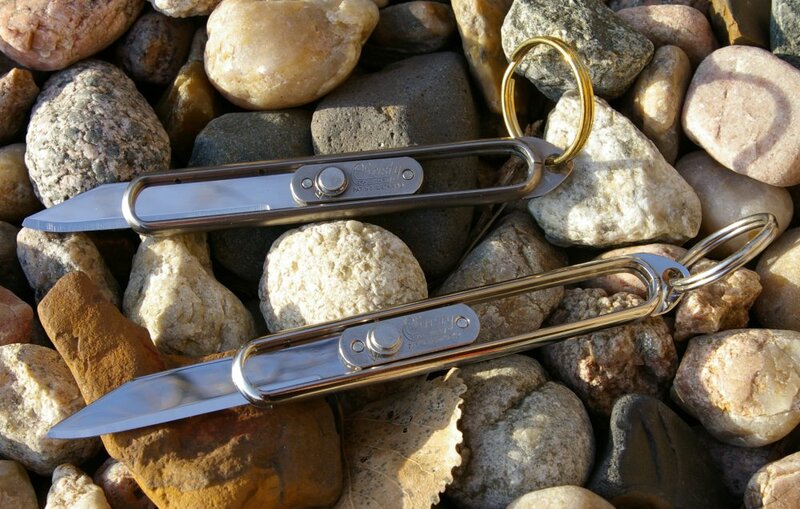 The single handed operation is what made the Christy knife so handy along with the blade quality. You can tell that Christy has a long history of making scalpels and razor blades, because for me this has always been an exceedingly sharp knife. Although the Christy knife is designed for simple blade replacement, I have had the same blade in mine for the last ten years and the edge only being touched up occasionally with a ceramic hone. I love that the Christy knife remains 100% American made and backed by a common sense lifetime warranty which does not cover re-sharpening or abuse, but any other defects. Several other the reasons I love these little knives are the extreme light weight, ease of use, and scalpel edge holding, however durability is quite impressive. 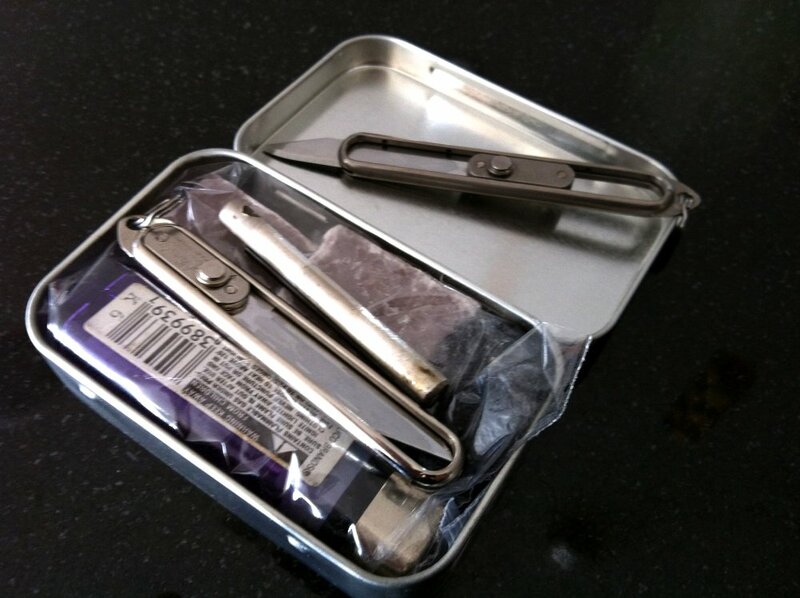 The shear amount of cutting abuse I have thrown at this little knife over the years and has been extensive. I am not using it to pry open boxes, but I have used the ring end as a screwdriver and to lightly pry open various things more times than I can remember and it has held up. The nice thing is that that same exact quality and design I purchased about a decade ago is retained in the existing design. There is not much to the knife from a parts perspective however everything fits well together and the finishes are all excellent gift-able quality. The original Christy knife had a brass handle, however the next oldest model had a nickel finish which remains one of their current models. The black nickel Executive version I originally purchased is very sharp looking as well (mine, not so much now) and the new Teflon nickel model provide a subdued elegant look of buffed stainless steel. 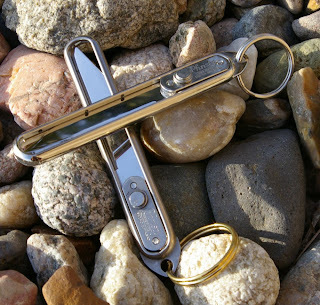 This is a tiny knife for having a nearly 2” blade that easily and invisibly drops into a purse or pocket and when on a key ring it is barely visible. 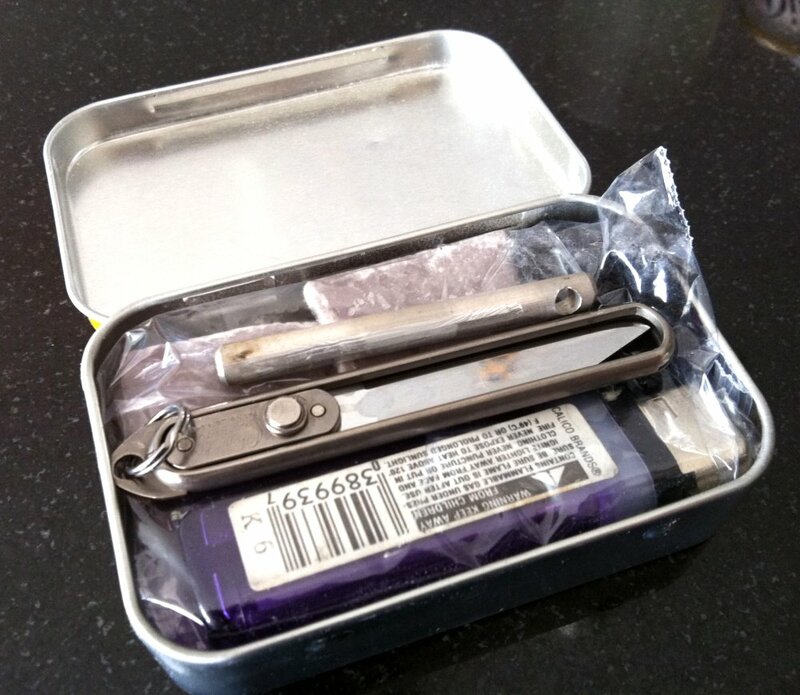 As you can see in the picture, the size fits perfectly into a mint tin for building your own mini-fire kit such as the one I assembled here complete with lighter ferro rod, tender and wax tender cubes. The backside of the blade works perfectly as a striker for the ferro rod I included in my kit. The Christy knife has a very long storied past from being in the hands of both ladies and gentleman, some of our servicemen during WWII, and even has been featured as 007 knife in a James Bond film... it’s versatile. For me the weight, sharp looks, ease of use, fantastic edge and extraordinarily inexpensive price make this an exceptional knife that can be used for cutting anything by anyone who just need a handy little knife.